Outdoor Wall Lighting - Artcraft ~ BEST PRICE GUARANTEED! Not only does outdoor lighting enhance the security of your home, but it is also a delightfully easy way to add personality to a patio. 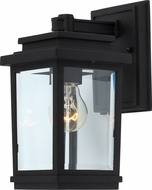 You can add style and comfort to a small entryway or a wraparound porch with attractive craftsman outdoor wall sconces, or you can choose to invest in affordable security by installing fashionable energy efficient lighting. By simply installing quality discount outdoor wall lighting fixtures, you will gain peace of mind and a freshly decorated outdoor entertainment space that will make your home more welcoming. At Affordable Lamps, you can find select outdoor wall sconces and recessed LED wall lighting at affordable prices, and when you buy fluorescent lights, you can even drastically reduce your monthly energy bill! What are reasons for installing outdoor wall sconces? The number one reason for installing outdoor lighting is crime deterrence. Decorative outdoor wall light fixtures such as security flood lights enhance the feeling of safety in a residence, and can also reduce an individual's isolation by shining a welcoming light that invites friends and neighbors to drop by. Consider one of your outdoor wall sconces a beacon to friends and a warning to criminals. Where does an outdoor wall light belong? 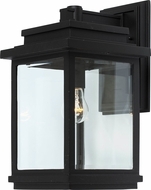 Outdoor wall mount lighting and sconces are perfect near the front door, back porch, or by the side door of the patio. By adding lights outside your home, you can illuminate large areas, which means that your outdoor living space will be much more useable and inviting. Who are some leading lighting manufacturers in outdoor wall lighting? Quoizel Lighting is one of four featured brands that provide superior outside wall lighting. Enhance the atmosphere of your garage or pool area with Quoizel outdoor wall lighting fixtures in aged copper or antique brass finishes. These outside wall lights are available in several tasteful and appealing styles, such as craftsman, contemporary and Mediterranean. 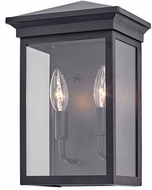 Forecast Lighting Outdoor Lighting is another manufacturer that offers excellent outdoor wall mount lighting options. Similar to Quoizel Lighting, Forecast Lighting's outdoor lighting features fluorescent and incandescent models. Forecast Lighting is famous for contemporary outdoor wall lights, and will impress you with its selection of outdoor wall sconces with their bold finishes and strong linear designs. 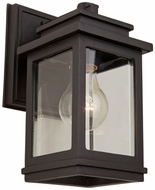 Consider their metropolitan or nautical outdoor sconces to light up your porch! Creative Systems Lighting (CSL) is another reliable company that creates outstanding outdoor wall lights. Many of their customers are commercial consumers, such as lighting contractors or architects looking for the perfect lighting options for an outdoor space. 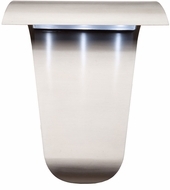 CSL provides a wide variety of handsome, energy efficient lighting, such as outdoor wall mount lighting fixtures in brushed steel, chrome or aluminum. LED and Xenon options are also available, and since LED outdoor wall sconces last longer than incandescent lights, you can spend more time entertaining and less time replacing bulbs. Arroyo Craftsman Lighting is another manufacturer that produces attractive wall sconces that can resist the harmful effects of damp weather. In addition, Arroyo Craftsman Lighting delights in customizing outdoor wall light fixtures, which means that customers can choose the finish, glass, and overlay of most of their outdoor wall lighting. This means that you can have a backyard party after lighting your walkway and gazebo with Arroyo Craftsman Lighting outdoor wall lanterns, and you can add more charm by choosing interesting patterns such as hummingbirds or T-bars. Whether you select nickel finish contemporary outdoor wall lights or colonial outdoor wall sconces, you'll be glad that you visited AffordableLamps.com first!